Ganesh Chathurthi is just around the corner, and you know what that means – lots and lots of modaks!! 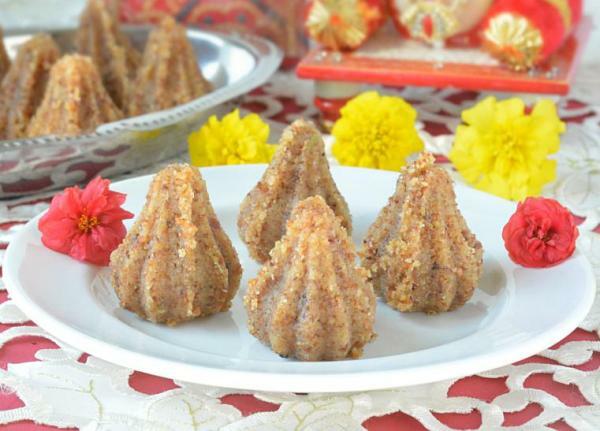 Those soft, triangular delights are popular all year round, but they gain special significance during this festival, being considered the favorite food of the elephant deity Ganesha. Not surprising, since one of his many names is ‘Modakapriya’, translated to modak-lover!! This is the reason modaks are offered during Ganapati pujas, usually in odd number like 21. 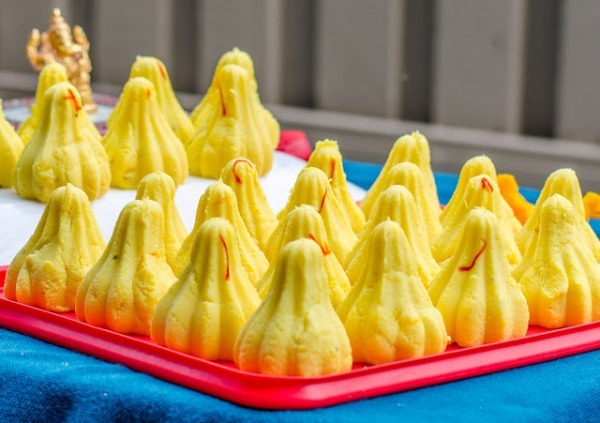 Did you know that Japan also has a modak version, also offered as a divine offering? Yes, it’s true! Their modaks are shaped differently, however, and use a bean paste and curd filling instead of coconut. 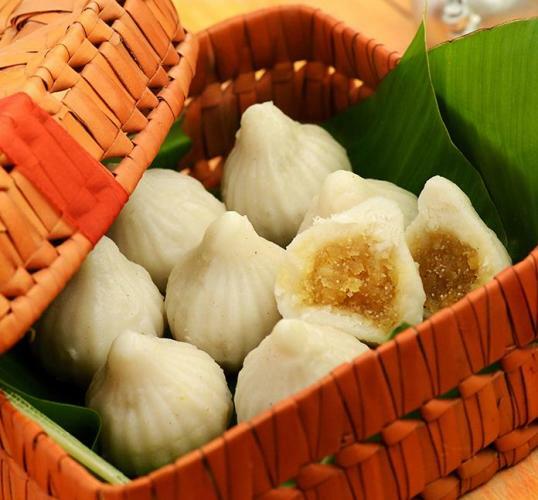 Modak is also called modaka or mothagam, and the steamed version, called Ukdiche Modak, is the most popular one. 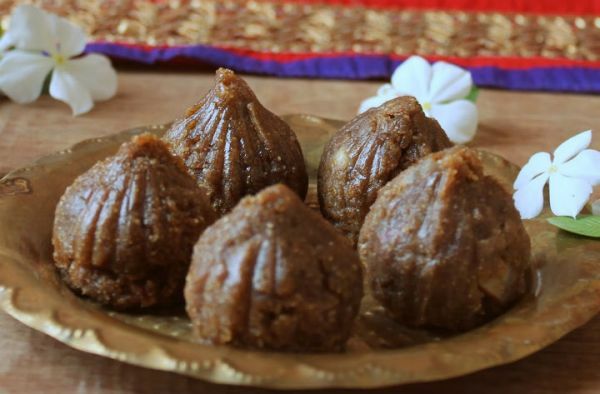 The classic modak has a shell made of rice flour, and a filling of coconut or jaggery. 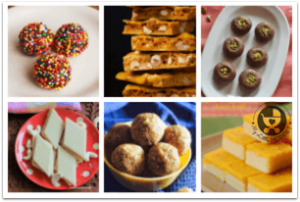 Modaks are generally sweet, although savory versions are also being experimented with.  This is a must have to make modaks, and the moulds are available in plastic, aluminium or stainless steel. Go for a non-plastic version for better quality and more durability. 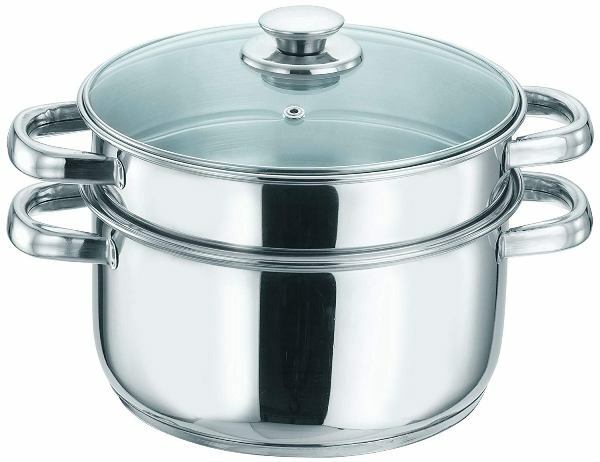 You can steam modaks in an idli steamer or any other steamer you usually use. It can be bamboo, steel or aluminium, although you can try a microwave steamer too. Modaks are offered to the deity and they’re also served to guests. 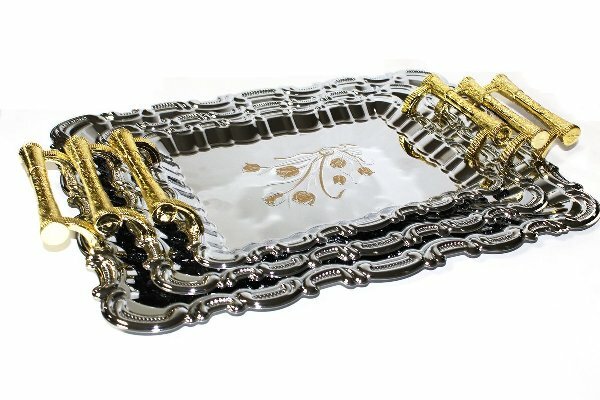 Serve your yummilicious modaks in style with a beautiful serving tray to bring out the festive spirit. Modaks are also great to gift to your family, friends and neighbors, but don’t just dump them in any old plastic container! 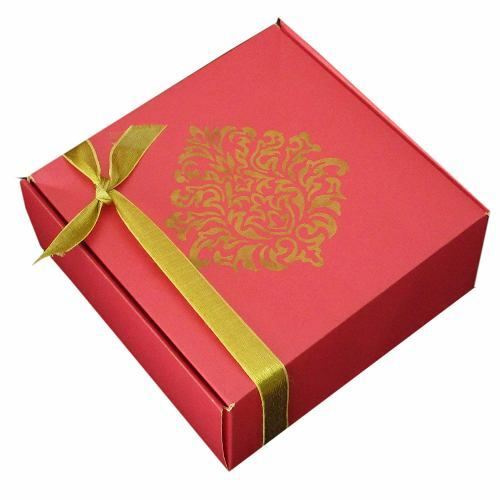 These pretty sweet boxes are perfect to gift, and match the lovely treats inside. 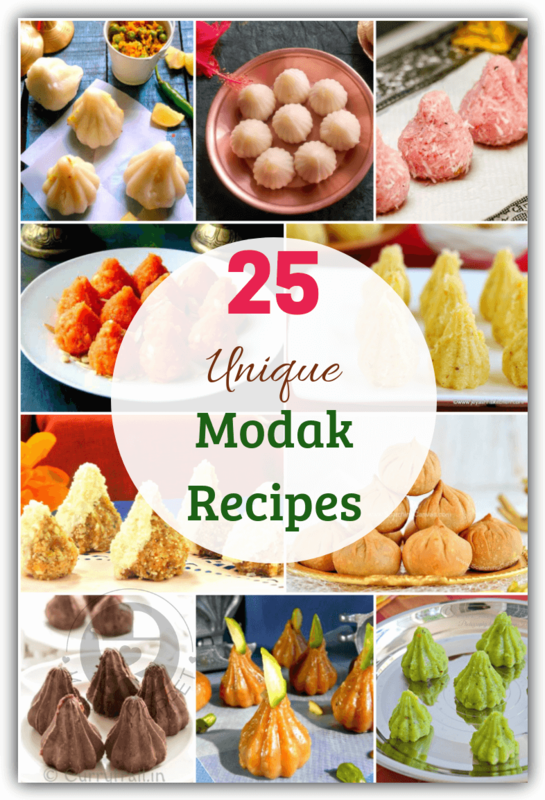 So I’m sure you’re waiting to see the cool modak recipes we’ve got lined up! 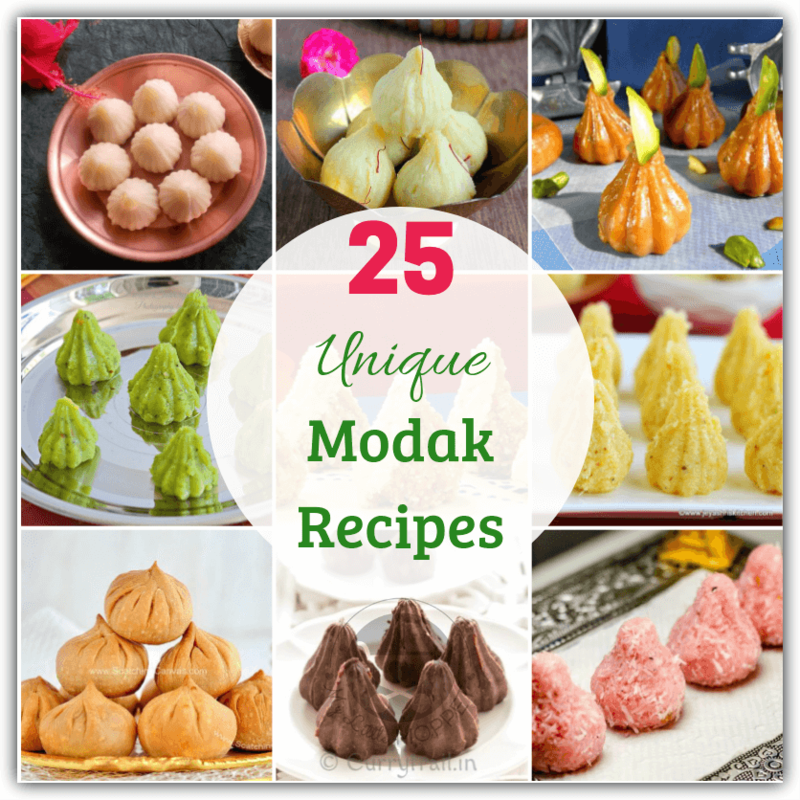 We’ve collected here a list of 25 modak recipes, some of which are traditional elements, while some use some cool and quirky combinations. At any rate, we’ve got enough here to keep everyone in the whole area happy! 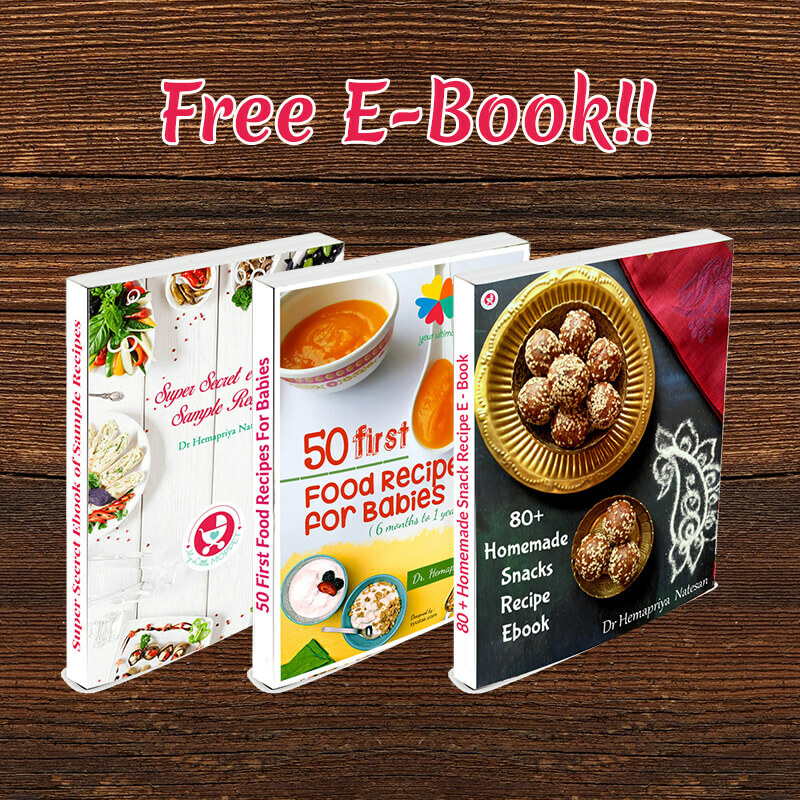 Note: Some of these recipes mention the use of refined sugar, which is not exactly recommended for good health, so please feel free to skip it. You can replace it with natural sweeteners like Jaggery Powder, Coconut Sugar or Dry Dates Powder. 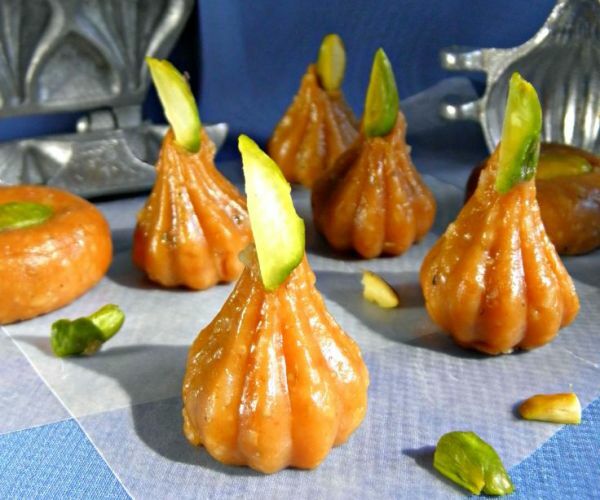 Let’s begin with the classic Ukadiche modak recipe, courtesy the queen of cookery, Tarla Dalal! This is the original recipe that features a rice flour shell, stuffed with a mixture of jaggery and coconut. 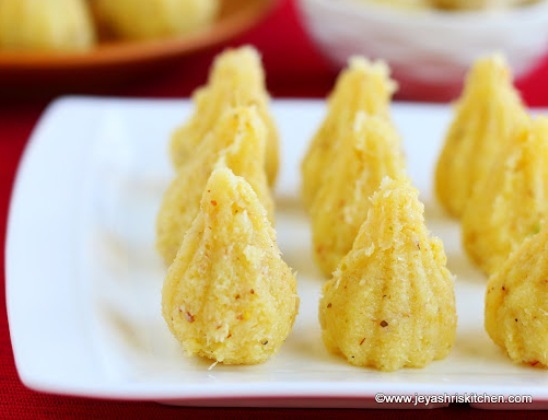 So if you’ve got modak purists in the family, you can make some of these for them. 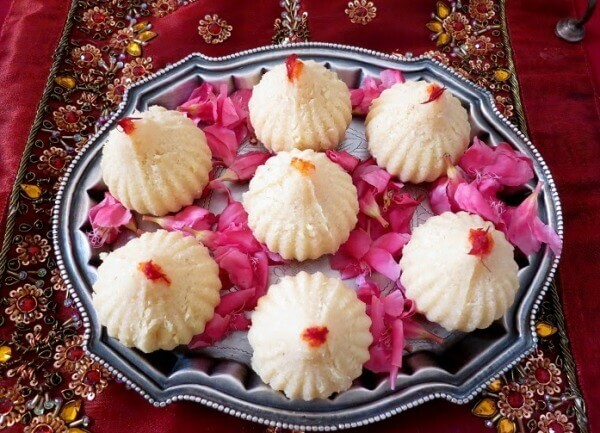 Raks Kitchen has a grand modak recipe that looks delicious! This recipe is sugarfree, using dates instead, along with an assortment of nuts. Roasting really brings out the flavor of the nuts, so don’t skip that step. 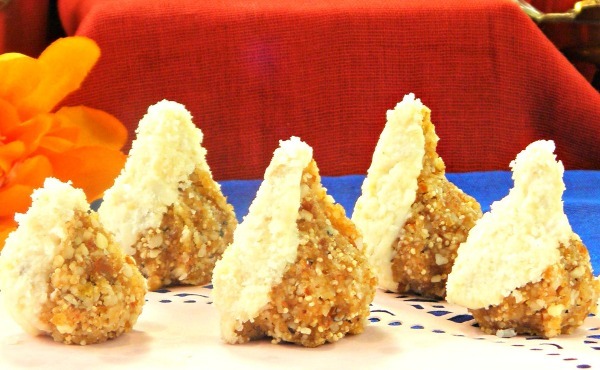 Just the name of this modak sounds delicious, with soft cheese and saffron giving it a lovely flavor. I think I could gorge on these for days on end. 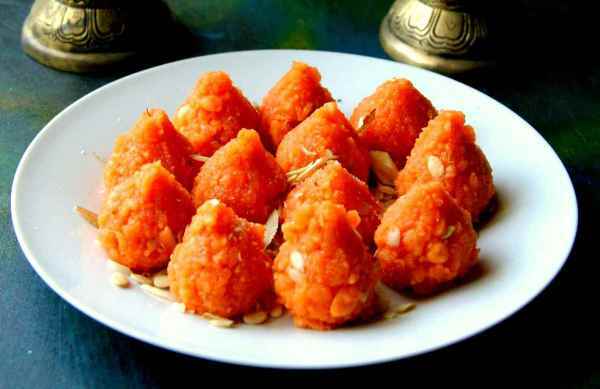 The saffron also gives it a beautiful golden color, making it truly a divine treat!! Get the instructions from Herbivore Cucina. 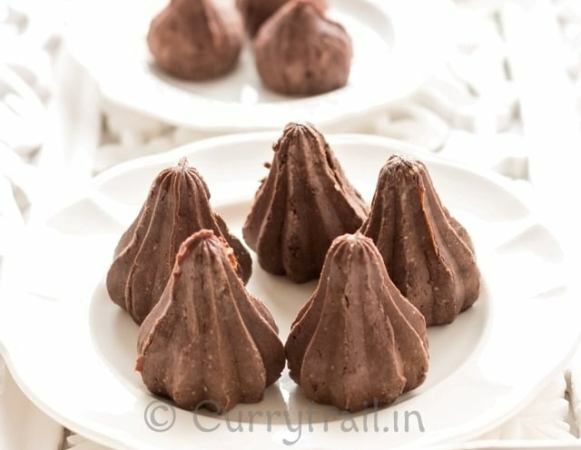 You can’t have a modak recipe list without including a chocolate modak recipe! Curry Trail uses a chocolate and almonds classic combo, which is why nutty chocolate bars are so popular! 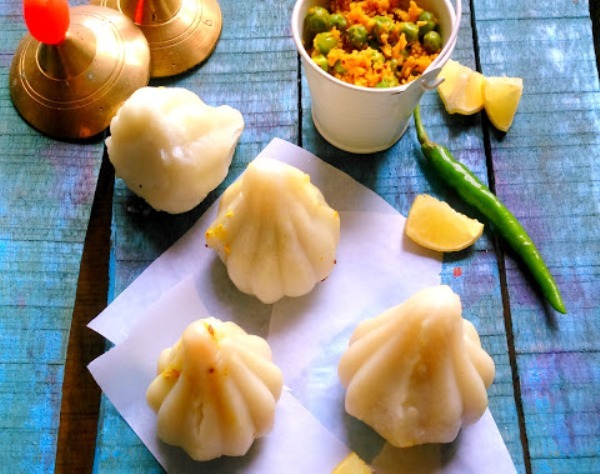 This is one modak recipe the kids are sure to love! Many of us have lovely childhood memories of munching on guavas grown in gardens in our grandmothers’ homes. 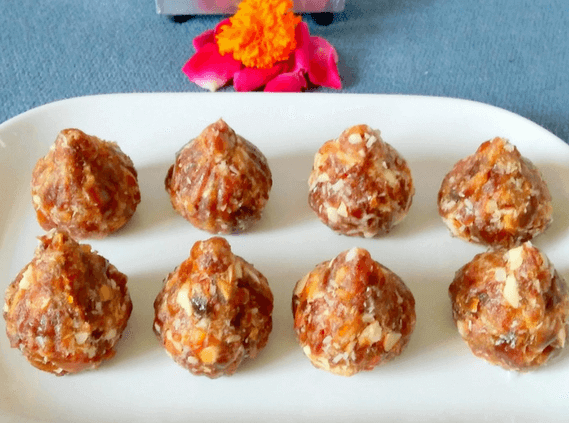 Indfused brings back those memories in this incredibly flavored modak recipe that has guava paste, nuts and coconut. Use jaggery powder, coconut sugar or dry dates powder instead of white sugar to up the health quotient. 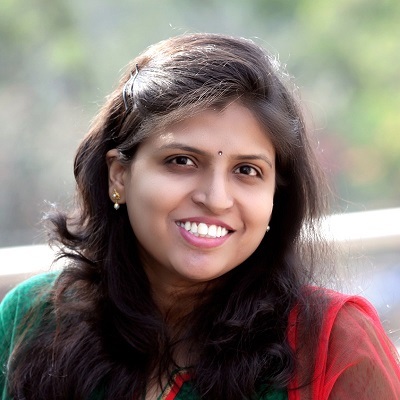 Mawa is a mainstay in many Indian festive sweet dishes, and Chef and Her Kitchen uses it in a simple modak recipe. The result is creamy, melt in your mouth modaks! I’d suggest using coconut sugar to get a nuttier flavor and sweetness without the harmful effects of refined sugar. If you’re like me, you’re always on the lookout for simple recipes, especially no-cook ones! 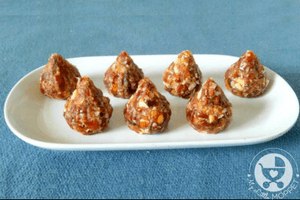 That’s why this no cook dry fruit modak recipe is a winner, also because it’s made with just three healthy ingredients – dates, almonds and coconut! 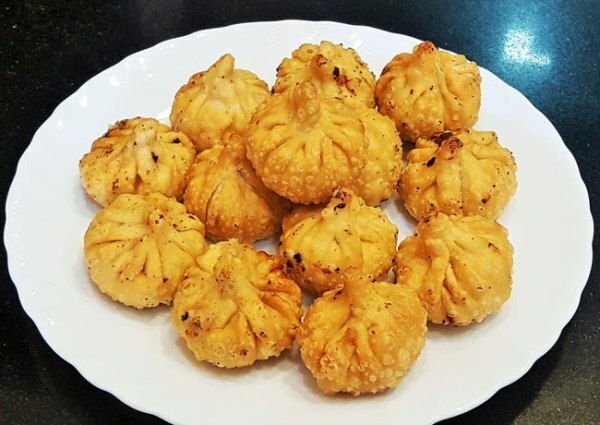 Sooji modak, also called rava modak, is a basic recipe where sooji replaces rice flour. Dry roasting the rava gives it a slighter toasty flavor than rice but maintains its versatility, adapting well to all kinds of stuffing. 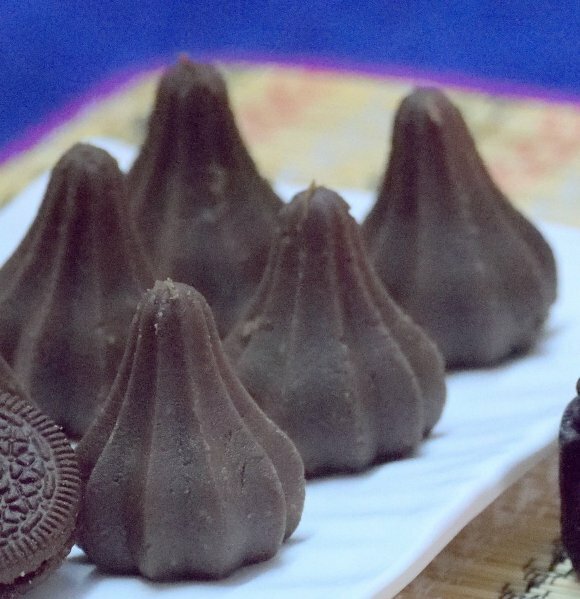 Oreo cookies, paneer and modaks – now that’s not a familiar combination you hear about! East meets west in this lovely fusion dessert from Archana’s Kitchen. 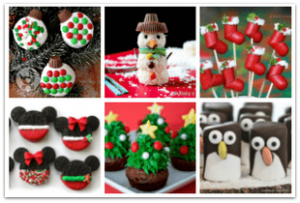 Kids are sure to recognize familiar flavors and wonder where it’s coming from! 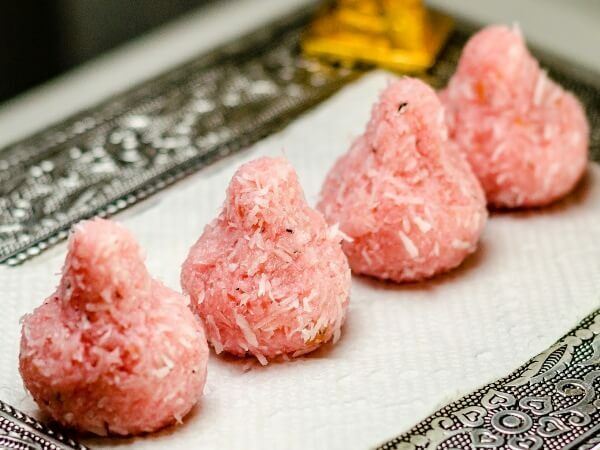 Gulkand is a well loved ingredient for festive desserts, and it takes on a rose modak shape in this recipe from Maayeka. You can also add some gulkand to the shell for pretty pink modaks that also make great gifts. 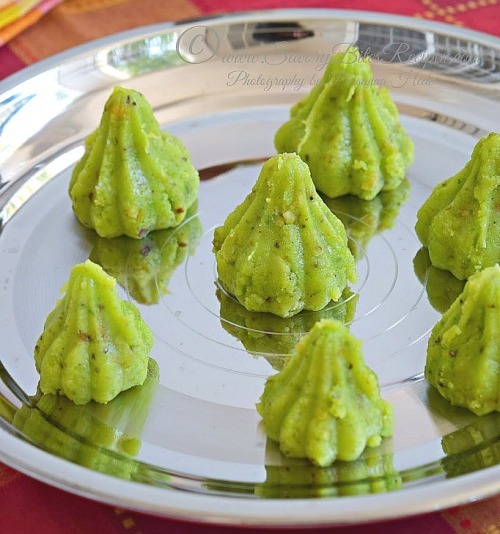 Here’s another interesting variation on the popular modak, using pistachios in this recipe from Savory Bites. Look at that gorgeous green color! 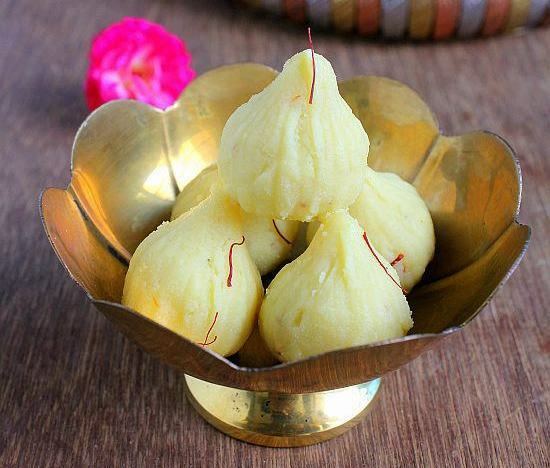 Skip the white sugar and go for a natural sweetener so that you don’t take away from the health benefits of this modak recipe. Urad dal is ground with milk to make this protein-rich and heart healthy modak recipe from Ruchi’s Kitchen. Using powdered jaggery will make the taste more mellow, and add a lovely color to the finished product. 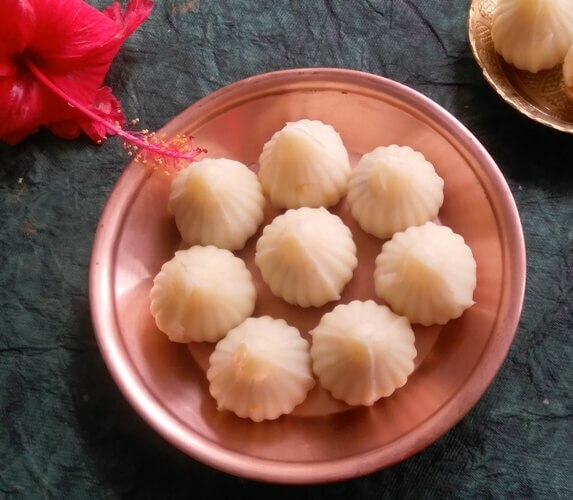 This Shahi Coconut Modak from Jeyashris Kitchen sounds like something royal, and it’s a recipe that’s indeed fit for a king! With lots of coconut and nuts, what your get is an indulgent mouthful in every bite! 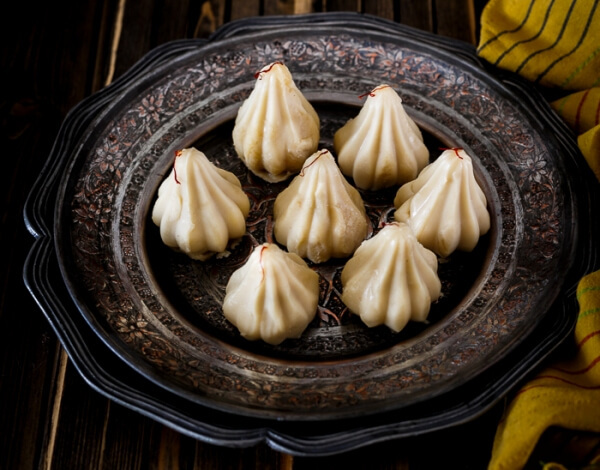 Here’s another unique modak recipe from Jagruti’s Cooking Odyssey. 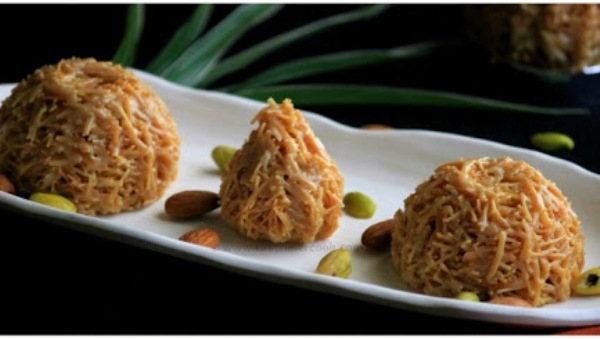 Use fresh desiccated coconut for best results and see if you can make the caramel at home too. These modaks are truly rich and delicious and are sure to impress your guests as soon as they dig into them. 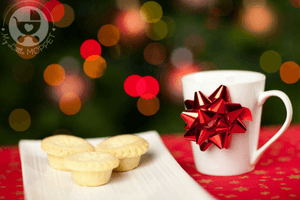 After all that sweetness and richness I’m sure you’d like a break, and we’ve got just the solution – more modaks! But this time, they’re filled with a savory peas and coconut stuffing, making them completely healthy! Get the instructions at A Sweet Vegan World. Vermicelli kheer or payasam is a regular favorite at our home; everyone loves it and that’s why I’m a little partial to this recipe from FirstTimerCook! Roasted vermicelli or seviyan give the modaks a lovely aroma and of course, extra crunch!! I could sing praises of ragi all day long and still not tire; it’s such a healthy superfood! 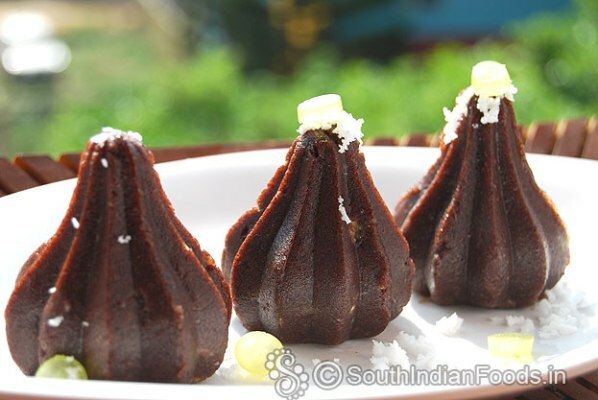 So it’s only natural that we’d want to try a modak recipe made from ragi flour, like this one from South Indian Foods that also has a chana dal and jaggery filling. 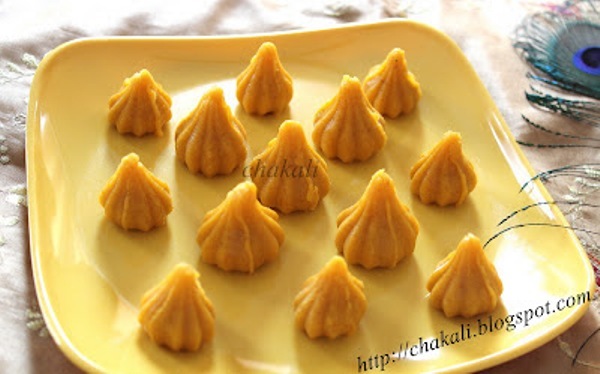 Chakali features the perfect modak recipe for mango lovers with just three ingredients! If you have mangoes that are sweet enough, I think it’s safe to skip the sugar – why do you need that refined stuff in your body when you can have the natural delicousness of the king of fruits? 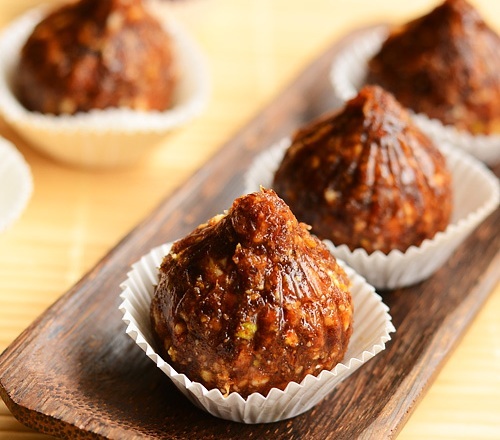 Love motichoor laddus? 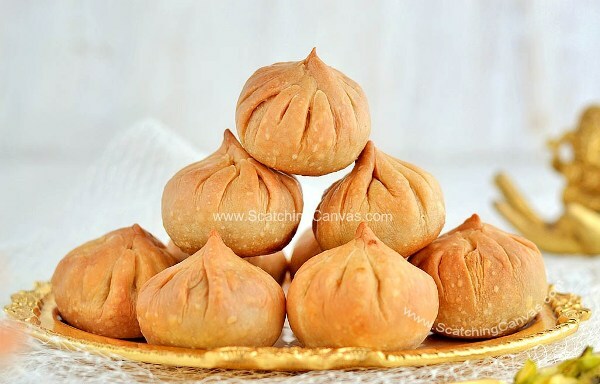 Then you’re going to be a huge fan of this motichoor modak recipe from Archanas Kitchen! 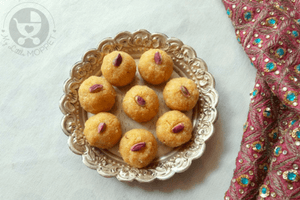 With rose water, cardamom and elaichi, this is a beautifully flavored sweet dish, but it’s a little heavy, so go easy on the modaks if you’re watching your weight and your waist! Adding strawberries to any recipe immediately makes them look so pretty, and this modak recipe from Herbivore Cucina is no exception! These are perfect for gifting, and you can get that gorgeous color from fresh strawberries as well! No, it’s not just cupcakes or muffins and pies that can be baked, modaks can be baked too! Scratching Canvas has a recipe that uses all purpose flour, but I suppose you can replace it with whole wheat flour or go for half refined and half whole wheat. 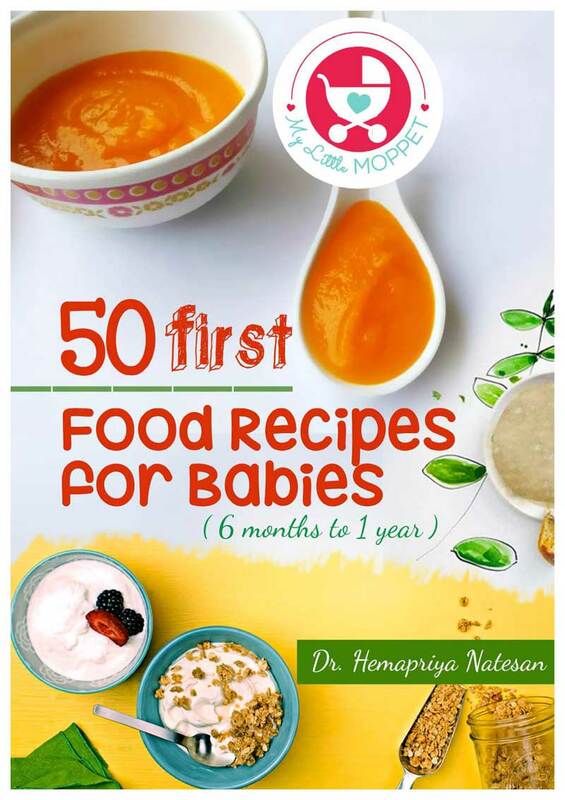 Sathumaavu is not only for your baby, it’s perfect for the whole family – and your friends! Awesome Cuisine has an easy sathumaavu modak recipe that everyone’ll love. The sathumaavu makes this modak recipe incredibly nutritious, and gives a nice mealy texture to the modaks and just look at that gorgeous color! 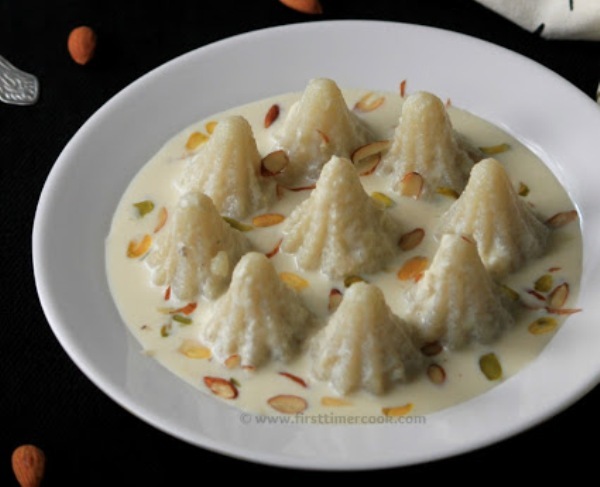 If no festival in your home is complete without a kheer or payasam of some sort, don’t worry. 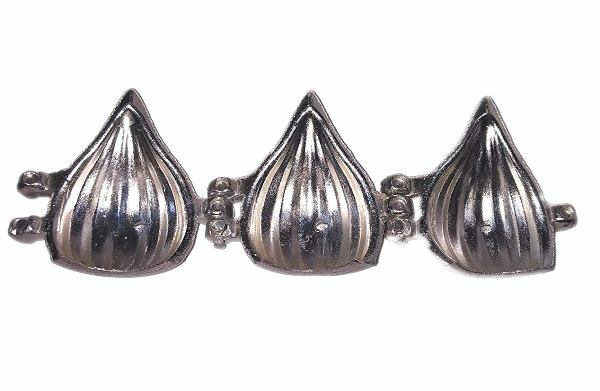 FirstTimerCook has a unique modak payasam for you! You can try any modak flavor of your choice, as long as it’s steamed. I can imagine the chocolate ones will be yum in that milky base! Once in a while, just forget about calories and feast on a crunchy, munchy treat like these fried modaks from Madhuras Recipe! Just imagine biting into this crispy modak and hearing that satisfying crunch ….bliss!! You can mix and match these modak recipes, using the filling from one with the shell for the other, but do keep some harmony of ingredients in mind. 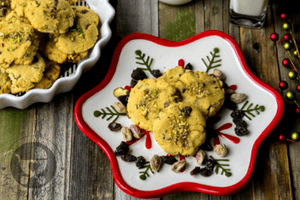 Make some modaks in different colors and arrange them beautifully on a platter or a serving tray or in a gift box. They’ll be a feast not just for the taste buds but for the eyes as well!